This is what I wore to school today. I wanted to wear something for the holiday but I didn't want to go as far as being one of the few brave souls walking campus in full-on Halloween garb so I opted for a subtle nod to the day in this ensemble. I thought it looked candy corn-ish. Anyways the vintage dress is from a store in Madison, WI called ReThreads that I bought for somewhere around $15. 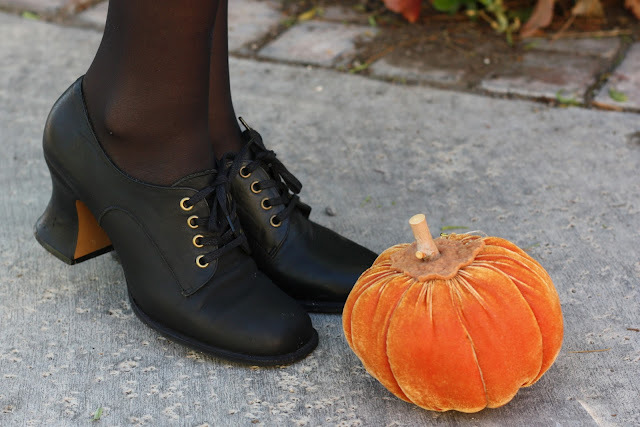 The witchy looking vintage shoes were recently purchased at a Desert Industries thrift store in Vegas for $8. I hope you all have a splendid evening! Hey, thank you! Yes, thrifting is definitely addicting once you see what amazing pieces you can find. I'll have to check out your blog. Thanks for stopping by mine & I hope to hear from you again!